HomeRubber Bracelet WristbandsYouth Size Rubber Awareness Bracelet Wristbands"Alzheimer's Awareness" Purple Rubber Bracelet Wristband - Youth 7"
"Alzheimer's Awareness" Purple Rubber Bracelet Wristband - Youth 7"
You know someone with an Alzheimer's challenge, show your support with this purple rubber wristband for the cause. 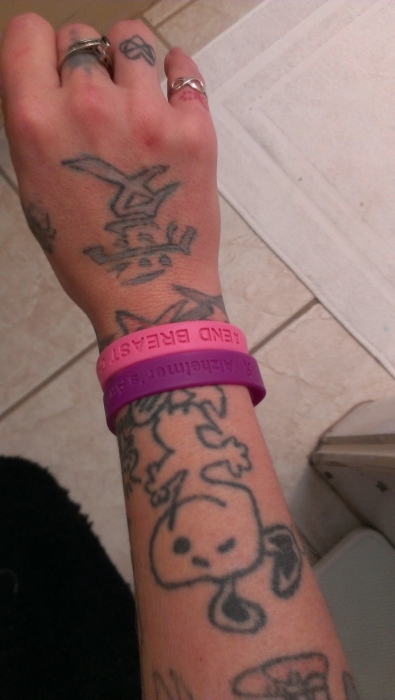 Buy the youth size "Alzheimer's Awareness" Purple Rubber Bracelet. Our Alzheimer's Awareness Wristband is made from 100% silicone rubber, in an individual polybag. We also carry Alzheimer's Awareness Ribbon Magnets. I was very happy when I found this site. I have very small wrist and always is hard to find any bands that fit. I wear purple proudly because I lost my grandma to Alzheimer's and now my mom has it. Just what I wanted, came quick! The only problem I had with the bracelets is that, when I received them, they appeared to have been stored improperly. They were all bent in the same way. You'd think, being rubber, that they'd spring right back to form, but even after a couple of weeks, there is still a bend in them. It's less than when I received them, but still there. I'm sure they will eventually return to form, but I was disappointed nonetheless.